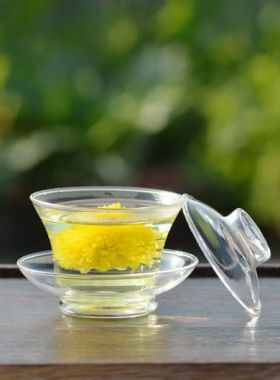 Combining with Dragon Ball White tea, chrysanthemum not only creates a richer taste and fragrance, but also contributes to good health benefits. 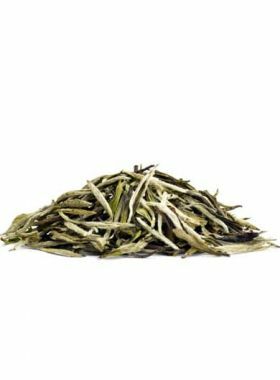 Since our flowered dragon ball teas are loved by many customers for their small, cute appearance, TeaVivre has specially selected two more types of dragon ball white tea, and this Chrysanthemum dragon ball is one of them. Although it comes from the same tea garden as some of our black dragon ball teas, their respective bushes are different: the original bush of this chrysanthemum white is Jinggu Dabai Cha, with one bud and one leaf for each “piece” of the material rolled into a ball-like shape along with Yunnan chrysanthemum. After brewing, the aroma of this tea is very pleasant and it carries a smooth, sweet taste, with every steep giving a slightly different scent and flavor: the chrysanthemum taste is most prominent in the first three steeps, while after that, the sweet honey flavor of the white tea starts to ooze out. As the ball opens, the fruity taste grows in strength, and when it completely unfurls, the taste of the leaves themselves quickly dominates. However, allowing it to steep for too long may turn the taste strong and bitter; if you brew in a cup rather than a gaiwan, though, this tea can be brewed all day long. The leaves for this tea come from Jiu Tai Po tea garden, in Pu’er City at an elevation of a little over 2000m. 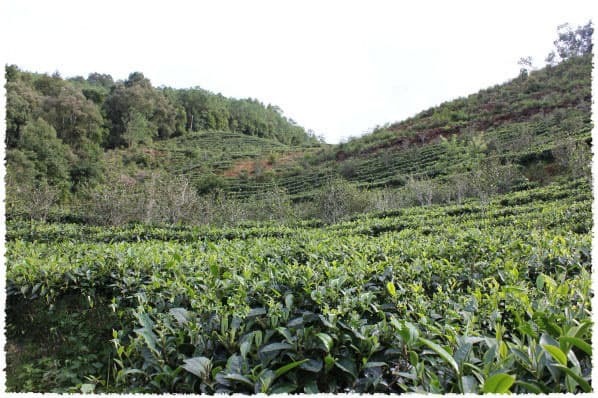 This garden is surrounded by a variety of ecological tea regions, such as Taidi Cha, or plantation tea, and old tea tree and ancient tea tree growing regions. Among these, the old and ancient tea tree regions are located at a higher elevation, near old forests. This garden is positioned in a location where no cars pass nearby, in a natural environment far from human intervention. Out here, natural poultry manure is considered to be one of the best (and most abundant) fertilizers. 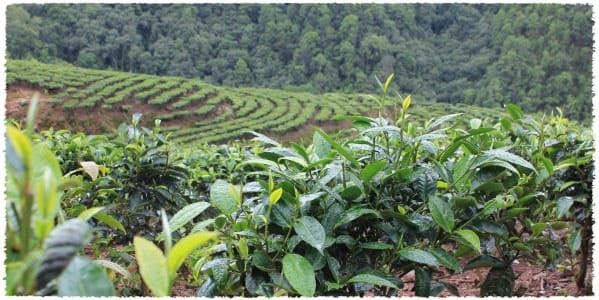 In more recent years, this garden has begun to grow Taidi cha, with all of these plants coming from the Jinggu Dabai Cha species. The leaves of these trees are more expensive than those of older tea trees, so you don’t need to worry about buying a half-fake tea of Taidi cha mixed with leaves from old trees. With more than thirty years of experience in tea crafting and processing, Mr. Yang, as well as other farmers in Huidi village, make their living by selling tea. When we spoke with Mr. Yang about why and how he had the idea to make flowered dragon ball tea, he said: “Our other tea makers have already created a very special blend of pu-erh mini tuo cha, with rose and chrysanthemum. That gave me the idea to make dragon ball-shaped teas with flowers.” After that, he started his experiments first with black tea: he found that, while Dian Hong black tea is not suited to being made into mini tuo cha shapes, it is perfect to be rolled into bigger dragon balls by a different processing method. Through this method, he could bring our the best shape and appearance for the tea. After he succeeded in producing dragon balls first with black tea and fresh flowers, Mr. Yang began to challenge himself in making dragon balls with other types of teas. So far many kinds of flowered black teas have been made, such as rose, chamomile, jasmine, and forget-me-not black teas. Along with these he has also made dragon balls with pure material, resulting in our Ancient Dragon Ball Pu-erh and Moonlight Beauty Dragon Ball White. 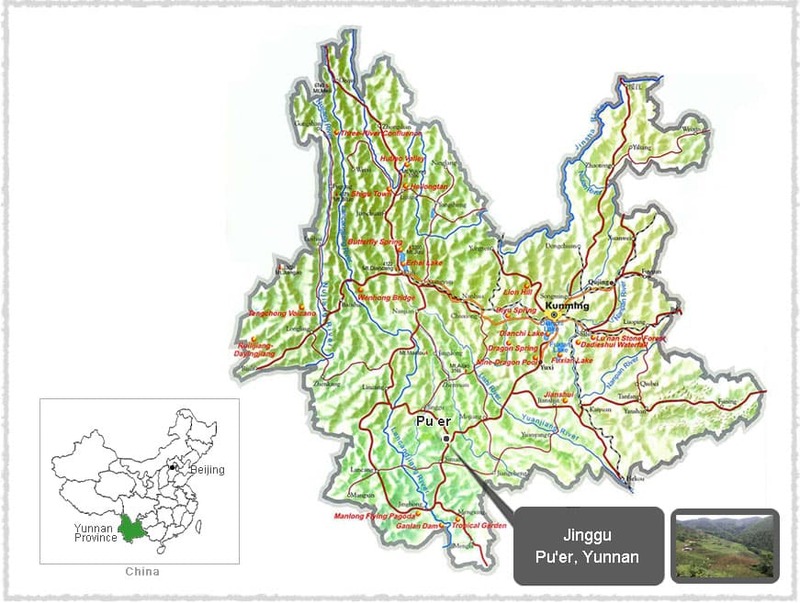 Jinggu, located in Pu’er City, Yunnan, is the birthplace of Jinggu Dabai Cha. The highest altitude here peaks at almost 3000m, while the lowest is 600m. The annual rainfall averages 1354m. 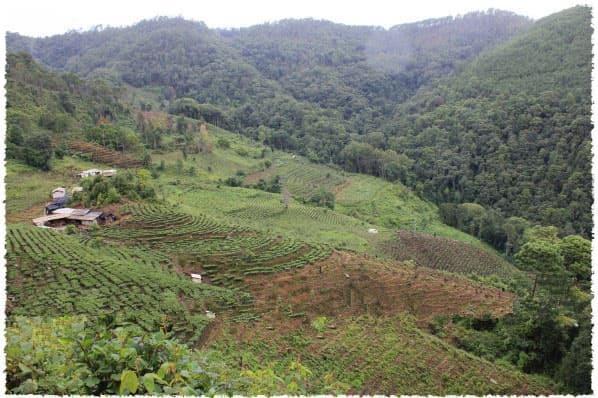 This place is characterized by its high mountains and deep valleys, resulting in a wide range of elevations that mark it as a near-perfect place for growing different species of tea. Other than Dabai Cha, Jinggu is also famous for other exports, such as rosin, “Xiangya”, mango, Yangta (秧塔) white tea, and fragrant sticky rice as well. Jinggu Dabai Cha is an arbor tea tree, originating from Mt. Kuzhu in Jinggu County. These particular tea plants grow abundantly in the local region, and can naturally reach between 4 and 5 meters with thick trunks and sparse branches. Dabai cha is characterized by large, soft leaves, and plump, fuzzy whitish-green buds. The spring picking of this plant, in one bud with two leaves, has a high level of soluble compounds. 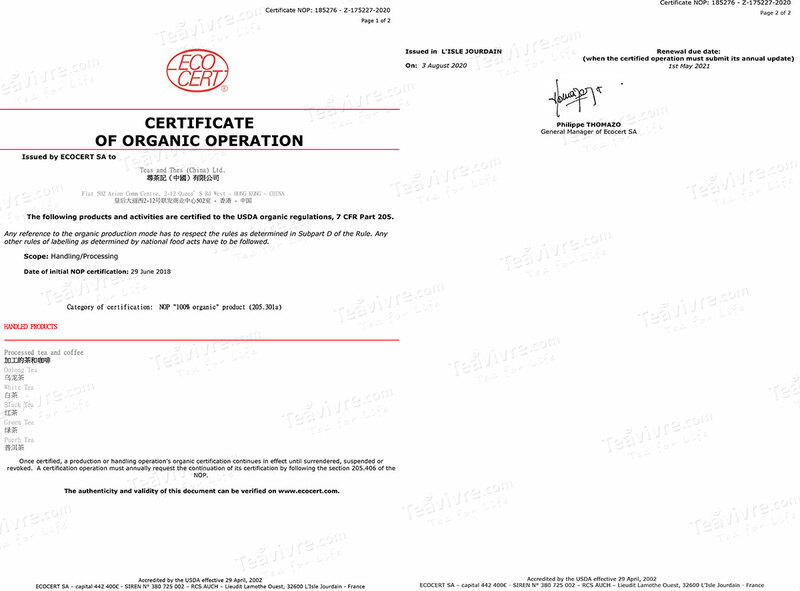 It contains 3.8% amino acids, 29.9% polyphenols, 5.2% caffeine, 15.3% catechin, and 46.7% water extractives. Because of this, it has a richer flavor and leaves a lingering sweet aftertaste in the mouth and throat. Tea made from Jinggu Dabai Cha is a good representative of the special features of Yunnan large-leaf species, a great material to make high-quality pu-erh tea. There is a beautiful legend connecting this tea to Bulang culture. Long, long ago, there was a beautiful young Dai (as in, the Dai nationality) princess living in Xishuangbanna named Seven Princess. She was married to handsome young Bulang man to forge friendly relations between the Dai and Bulang nationalities; Seven was not only beautiful, but intelligent as well, and with her help the Bulang people quickly learned how to plough and sow and work the soil, and from there to grow tea. Because of this, she is honored as the tea goddess of the Bulang people. Later, in honor of her, Moonlight Beauty white tea was chosen as a tribute tea to her, since people thought of this tea as the embodiment of Seven Princess’s wisdom and beauty.